← Vegans Say What? What Do You Feed Your Vegan Pets? Mexican food has to be on my list of tops and when I don’t feel like cooking but am hungry I often use chips and salsa as a meal replacer. Possibly not the healthiest of choices but it makes my heart happy. Last night was one of those nights. The little vegan was out for the evening so the hubby and I had planned on going out to eat but never found the motivation. Having chips but no salsa in the house I decided to throw something together and add some protein to it in order to have a little more substance. It came out really good and I will definitely be making it again so I thought I would share. If you aren’t allergic to avocados like me I would recommend adding them to the mix. Also I used what I had on hand so you can feel free to improvise. Mix all ingredients together and serve with chips. It made a filling snack for two. 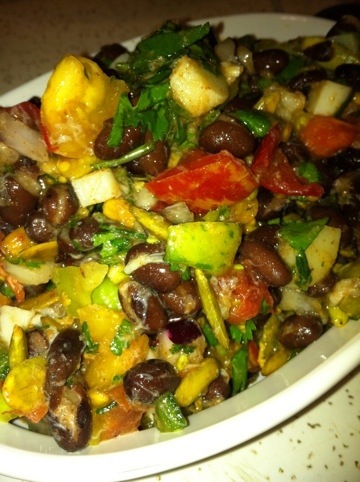 Gallery | This entry was posted in appetizer, Gluten Free and tagged appetizer, dip, salsa, vegan. Bookmark the permalink.